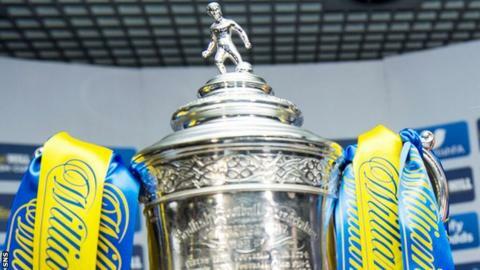 East Stirlingshire and Clyde were knocked out of the Scottish Cup as their respective Highland League opponents Huntly and Formartine United reached the third round. The Shire, bottom of Scottish League Two, fell to a 2-1 away defeat, while Clyde went down 2-0 at North Lodge Park. Elsewhere, Annan Athletic thumped Berwick Rangers 4-1, as Queen's Park, Elgin City and Arbroath all progressed. Queen's Park overcame Stirling University, City downed Spartans, and Arbroath defeated Brora Rangers. Ten-man Buckie Thistle saw off Edinburgh City, Linlithgow Rose claimed a win over Clachnacuddin and Cumbernauld Colts secured their place in the next round with victory over Auchinleck Talbot. Inverurie Loco Works came from behind to beat Edinburgh University 2-1. East Kilbride and Forres Mechanics shared the spoils at K Park, with a goal apiece from Dachie Khutsishvili and Sean Winter. "As Lowland League met Highland League on Saturday, the serious opinion among many at K Park was that, in five to 10 years' time, 'Kilby' will be well established in Scottish senior football." There was a goalless stalemate between East Fife and Stirling Albion at New Bayview and Lothian Thistle Hutchison Vale drew with Montrose. Nairn County and Wick Academy will also require a replay after County's Sam Urquhart struck late to level the scores at 2-2. Matches at Fort William and Turriff were postponed due to adverse weather.